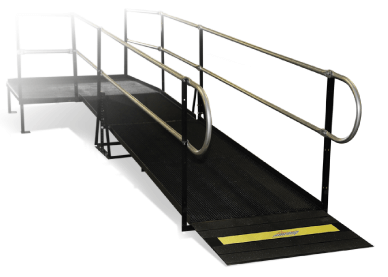 Amramp, North America’s Leading Wheelchair Ramp, offers many benefits that no other type of modular ramp provides. 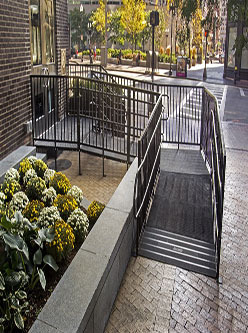 For office buildings, apartment and condominium complexes, hospitals and care centers, retail settings, restaurants and more – a ramp system from will ensure safety and provide accessibility to everyone using your facility. Only Amramp’s unique open mesh ramp surface allows moisture to pass through, reducing the possibility of dangerous ice film or mold forming on the surface. Wood, concrete and aluminum are solid surfaces that collect moisture. 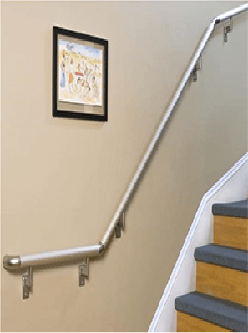 The Amramp surface offers a raised gripping pattern to make Amramp the most slip resistant ramp available, PLUS Amramp adds a special Amramp-grip coating to the ramp surface. This coating contains a disbursed particle that feels like sand paper. This all adds up to making Amramp the most slip-resistant ramp available. Amramp is made of durable steel, the same steel used in fire escapes. Wood and aluminum will burn and melt in the heat of a house fire. Remember, a ramp is a means of egress from the home in an emergency. Ask us for independent test lab data on ramp fire safety. 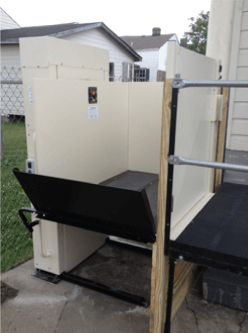 Amramp is available for purchase or rental. We offer free evaluations and install in days, not weeks or months. The Amramp system is made in the USA from recycled and 100% recyclable steel. Even after years of productive use, when are ramps are no longer needed, they can be easily disassembled and returned to our inventory to be re-used by someone else.